Try some of our UK video slots like this one! 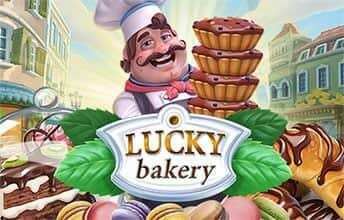 Lucky Bakery is one of the best slot game that lives in a quaint French village, where baking is life. Be absorbed by the array of treats on offer and spin your way through 5 reels of lettered symbols that look suspiciously like fondant fancies and also cakes, waffles and bonus hamper scatters. Are you the breadwinner? Are you feeling lucky? Based in the Estonian capital of Tallinn, Foxium were formed in 2015. This fresh-faced newcomer has already released two very popular games: Big Time Journey and Stereo Miami. As an online gaming developer, Foxium promises to take players on an experience unlike they have ever experienced before with fully animated, 3D game play. Offering something a little different to the norm, and with further games in the pipeline, Foxium is an up-and-coming name worth keeping a look out for. Take a step inside Wizards Lucky Bakery and cook up some delicious treats that will set your taste buds spinning! This 5 reel slot game has 25 paylines, with an RTP (Return to Player) of 96.02%. You can adjust your paylines to a low to medium volatility level which is great when all you want to do is stuff your face with bite-size wins. Bets start at 25p up to £62.50 per spin. Check best slot games like this one here. The 5 reels in Lucky Bakery is a buffet full of delightful goodies set against a cartoon Parisian street, the iconic Eifel Tower is just visible in the background you know you are in the heart of Paris where the patisseries are world famous. You can enjoy croissants, chocolate gateau, a stack of waffles and a cherry-toped cupcake. You also have your traditional card letters, J, Q, K, A and 10 which make up the llow-valuesymbols. The Chef is your Wild symbol, he will substitute for all other symbols to help you form winning combinations except for the Scatter which is the Box of Chocolates symbol. The Chef symbol also has the possibility of becoming the Surprise Multiplier Wild, during a spin a Surprise Multiplier Wild may land on reels 1, 3 and 5. When the reels stop they will randomly display the multiplier value of 1x, 2x, or 3x which will be applied to any winnings which they contributed to. If you land 3 of the Chocolate Boxes Scatter on reels 1, 3 and 5, you will trigger the Free Spins round which will reward you with 7 Free Spins. There are no further respins to activate in this feature, but each non-winning spin will increase the multiplier value for any further spins by 1x up to 6x. The Shuffle Feature is activated after a non-winning spin, here the symbols will rearrange themselves to create a winning combination for you. 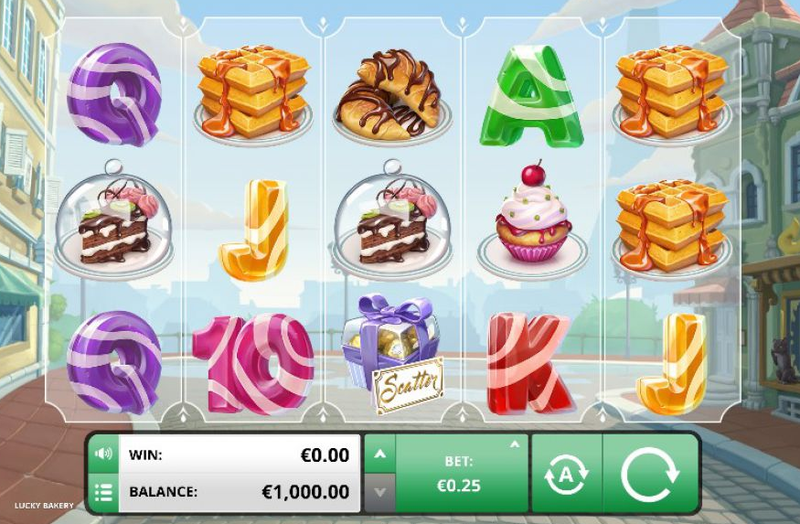 Lucky Bakery also features a Gamble Feature where the base game winnings can be gambled by either x2 or x4. You will need to click on the playing card symbol that appears above the spin button, you have the option of guessing the colour and double your winnings or guessing the suit of the card to quadruple your winnings. You have 5 chances to win, but if you lose you forfeit your winnings. The 3D graphics and animations in Lucky Bakery are so impressive that they make your mouth water just looking at all those delightful treats. The extra features keep this online slot game entertaining guaranteed to brighten up a dull day. If you love Lucky Bakery then be sure to play Down the Pub today!